The vibration of a slinky on the floor is an excellent way to show standing waves. The single loop pattern of the fundamental can usually be produced quickly. As you speed up the vibration to try to produce the second harmonic, it feels strange - you are feeling the tendency of the traveling waves to interfere destructively. The third and fourth harmonics can be produced with effort, but in between the resonances the motion is disorganized and awkward. 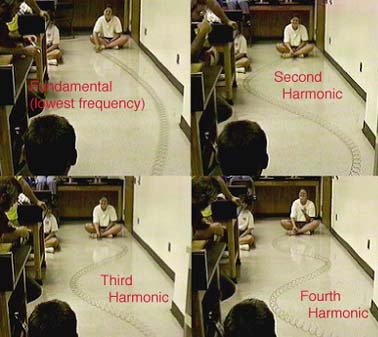 The constructive interference which produces the standing wave depends upon the phase reversal upon reflection, which can also be demonstrated with the slinky. Experimenters are Kelly Jewett (right), Lisa White and Kim Wimpey.